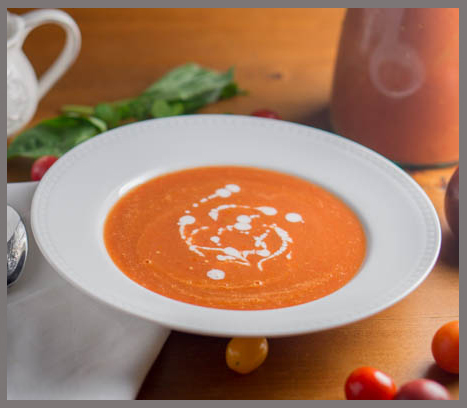 This chilled tomato soup is a classic spanish dish and the addition of a touch of coconut milk, makes it a great way to add a creamy flavor without dairy. The coconut milk pairs very nicely with the garlicy tomato flavour. Use what you have available. Cucumber, celery and any type of pepper work well. Cover soup and chill in the refrigerator for at least 2 hours. Serve in cold soup bowls, drizzle with coconut milk if desired. Become a conscious consumer because knowledge is power. Please let us know if you have any Mindful Monday recipes you would like to share. Knowledge is the single greatest threat to factory farming. It’s legal in South Africa to cage a mother pig (sow) so she can’t turn around for months but conscious consumers can help these sows. Read here for further information and here.